Oh, spring at the U-Dub! The best thing about it is that you don’t have to pay tuition to enjoy it. Anyone can wander through campus, and there’s much more to see than the striking, but fleeting cherry blossoms in the Quad. 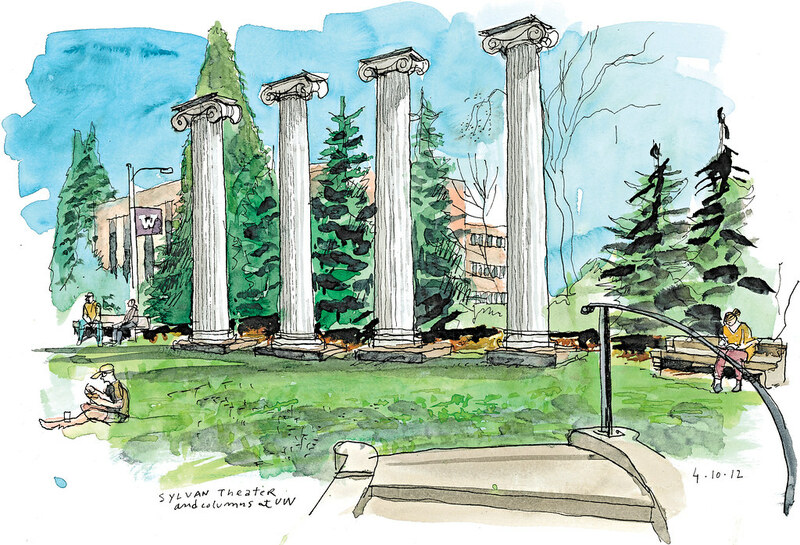 This year, with the UW celebrating its 150th Anniversary (“HuskyFest” event wraps up Saturday), it was fitting that I discovered the Sylvan Grove Theater, home to some of the oldest-standing pieces of Seattle architecture: four, 24-foot Ionic columns that belonged to the original university building downtown. The lush garden space, tucked between the Rainier Vista corridor and the Paul G. Allen Center for Computer Science & Engineering, is so secluded even some students miss it. Emilia Ptak, a recent graduate relaxing on a bench with a friend, didn’t find it until her third or fourth year. Unlike the Quad, she said, it’s a quiet spot to concentrate and study. Block letters are so collegiate. A plaque by this giant “W” says the sign was donated by the class of 1960. Denny Hall is the first university building to open on the current campus, back in 1895. As I started to sketch, I could hear a tour guide address his group. “This is where we come from,” he said, pointing to the castle-like building. “And this is where we are going,” pointing to the state-of-the-art architecture of Paccar Hall to the east. Paccar Hall is home to the Michael G. Foster School of Business. I think Emilia Ptak had a point when she told me that the Quad is better for people watching than studying. On the sunny day I visited, the sensory overload was such that I can’t imagine anyone being able to concentrate there. 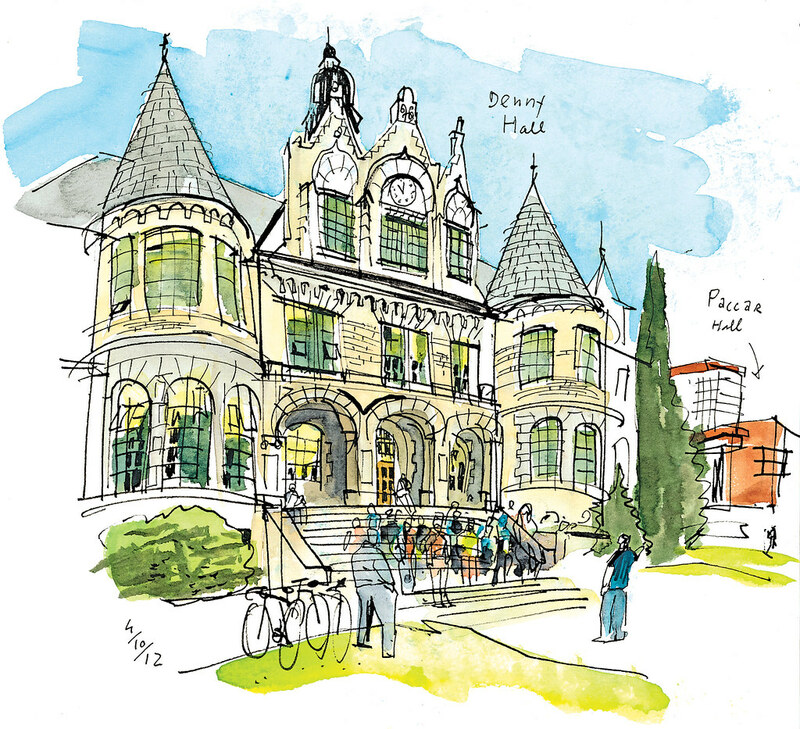 I sat on the steps of the Suzzallo Library building to sketch this view. Students crisscrossed the square in all directions on their way to class. Others stood under blue-covered tents, holding balloons and handing out fliers. 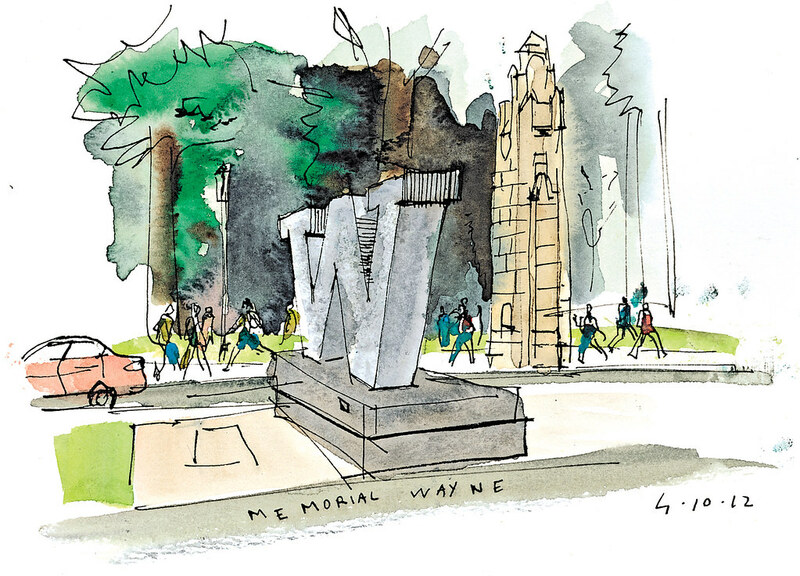 When I finished my sketch, I walked over to the other side of the square to order a pulled-pork sandwich from a food truck, then sat on the benches at the center of the square to eat and remember my own college days at another beautiful campus, the University of Navarra in Pamplona, Spain. What has drawn your attention around Seattle lately? 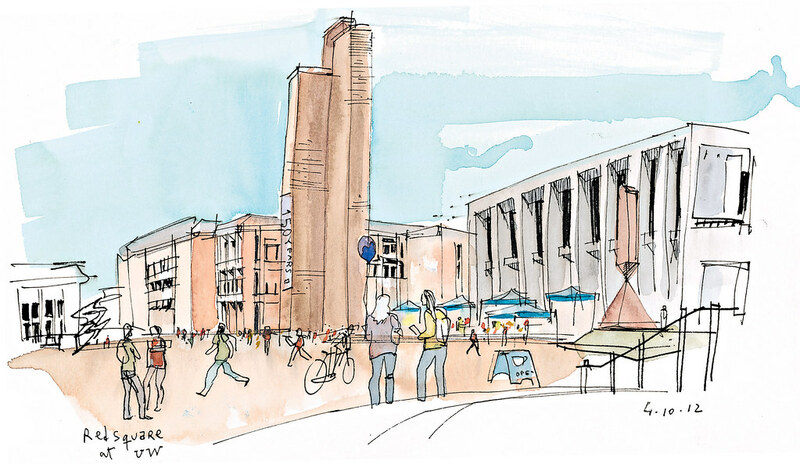 Send me your suggestions of interesting places and people to sketch via e-mail, Facebook or Twitter. Have a great weekend!